“Big Ben” actually refers to this bell within the Clock Tower in London. Thought it was time for some Olympics-sized stuff that weighs more than me. And since the Olympics are in London right now, the first thing I thought of was Big Ben. Naturally when most people point to Big Ben in London, they are actually pointing to the clock tower. Big Ben is the nickname given to the huge bell located in the belfry of the clock tower. The bell was cast in 1858 and first chimed the hour on July 11, 1859. 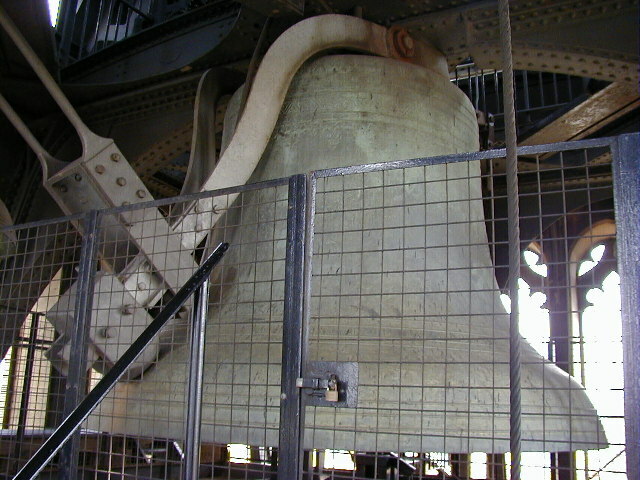 The huge bell is not rung by a clapper, but rather by a hammer located outside of the bell. In concert with the Great Westminster Clock, the bell is accurate to within one second. The clock is actually powered by gravity. There are weights on huge cables that are wound by the clock engineers three times per week. The engineers check the clock against the world clock from time to time and add or remove pennies to the pendulum to bring it back to perfect time. Weight of the “hammer” that rings the bell: Over 400 lbs. This entry was posted in Uncategorized and tagged Big Ben, Fat Acceptance, HAES, London landmarks, Olympics, size acceptance, Stuff that weighs on August 8, 2012 by fatchicksings.